If composer, arranger, and saxophonist Ohad Talmor still had one of those first-generation fax machines — you know, the ones with thermal paper that curled up like crazy — then the nearly 100 faxes he received from jazz legend Lee Konitz over a period of time might be thought of as little "scrolls" of sorts. Each one contained a musical germ of tunes and melodic lines that Lee created and jotted down. "As an improviser, when I create lines on the spot, I don't know specifically what's happening after the fact," explains Lee. "When I'm able to jot ideas down, I can go over them day by day. I ‘correct them' — or whatever — and then that's the end of it." Well, most of the time, that was the end of it ... until Ohad's fifteen-plus-year relationship with Lee blossomed into the channeling those ideas into musical settings that — compared to Lee's preferred situations of improvising in a duo, trio, or quartet setting — might be considered downright "orchestral." In that on-going collaboration, Lee's melodic lines have taken on new lives as inspired realizations by Ohad for ensembles that include the one documented here, the Lee Konitz-Ohad Talmor String Project, as well as the Lee Konitz New Nonet (heard on the OmniTone CD New Nonet), and even a big band project. "The String Project is mostly about a collaboration," explains Ohad, "along the lines of the one Miles had with Gil Evans, or of any in which two artists find each other and mutually compliment each other's work and creativity." In that respect, these musical settings are not about Lee the Soloist who puts himself on the line by dealing with Ohad the Arranger who brings unusual twists to the melodies he jotted down, but they are instead the result of a long process echoed not only in the writing, but in their playing, as well. "The music was fine tuned through countless concerts, with Lee and I talking at length about his role and my role in each piece," continues Ohad. "And then, above all, it is a unique and, as far as I am concerned, completely original exploration between the written and the improvised — both in terms of sounds and colors, as well as in terms of how the improvisers react to the sonic surrounding." The result is music that flows, naturally and organically, creating something new that's greater than the sum of its parts... and the parts are hardly insubstantial. Lee Konitz, winner of the prestigious Jazzpar Prize in 1992 (considered by many to be the highest international prize for jazz), continues to be one of the most individualistic of all alto saxophonists. Throughout his 60+ year career, his musical curiosity has consistently led him to musical contexts and collaborations that extend or redefine "jazz," beginning with Claude Thornhill, Miles Davis's Birth of the Cool Nonet, and Lennie Tristano in the late '40s, through a list of collaborators that reads like a Who's Who of jazz invention (and re-invention): Gerry Mulligan, Warne Marsh, Bill Evans, Paul Motian, Jimmy Giuffre, Elvin Jones, Charles Mingus, Andrew Hill, Gil Evans, Karl Berger, Don Sebesky, and even Bobby McFerrin. Saxophonist, composer, and arranger Ohad Talmor, recipient of the European Broadcasting Union Composing Award in 2004, is a leading voice in New York's creative improvised music scene. He's worked with Dave Douglas, the Carla Bley Big Band, and Billy Hart (to mention a few) and leads his own groups including his quintet NewsReel, The Other Quartet (co-led with trumpeter Russ Johnson), and the MOB Trio collective (with two CDs on OmniTone). Ohad also serves as musical director for the Steve Swallow Sextet and the Lee Konitz New Nonet (heard on the OmniTone CD New Nonet). He holds a composition degree from the Manhattan School of Music and, as a composer, draws influences from his background as a classical pianist, his love of Indian music, and hip-hop. For the String Project, Ohad's arrangements take full advantage of the wide variety of timbres possible with string instruments, melding those string sounds with reeds to span a pitch range from lows in the bass clarinet and cello to highs in the clarinet, alto saxophone, and violin. The results make the sextet sound like a "mini-orchestra" of sorts. "The sound of the strings is very inspiring to relate to," adds Lee, "and these guys are all improvisers, so they bring that improvisational feel to the music. It makes the music very stimulating." Having four accomplished string players who are also facile improvisers throws even more creative possibilities into the bubbling musical cauldron. At any one moment you might hear any of the members of the Spring String Quartet playing arco (with the bow), pizzicato (plucking strings), col legno battuto (striking strings with the wood of the bow), or using many other well-integrated modalities. The members of the Austrian quartet — Christian Wirth, Marcus Wall, Julian Gillesberger, Stephan Punderlitschek — met during their music studies in Linz and Vienna and gave their first concert as the Spring String Quartet in 1997. Since that time, the SSQ has gained a reputation as one of Europe's leading jazz-rock string quartets, probably because of the effortless way it manages a musical spectrum from baroque to modern music with lots of intermediate stops along the way. The interpretation of Lee's little faxed "scrolls" in Ohad's arrangements and the transformation of those arrangements by the sextet heard here borders on musical alchemy. In its purest moments, Inventions instantiates the very reason why creative artists struggle with and for their art: to transcend the ordinary and share something extraordinary — even magical — with the listener. There's an old Sydney Harris cartoon from Scientific American that shows two scientists standing in front of a chalkboard. Complicated equations and mathematical expressions fill the left and right sides of the board. As we read the caption where one scientist says to the other, "I think you should be more explicit here in step two," we see scrawled in the center of the board (instead of more expressions) the words: "Then a miracle occurs." Prepare yourself for the miracle of music. 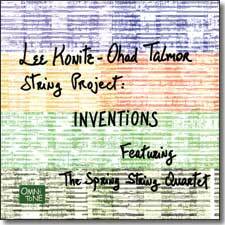 It's certainly a central component of these Inventions by the Lee Konitz-Ohad Talmor String Project.